The swells from Hurricane Alex have reached the Deepwater Horizon site, and the hard connection between the Lower Marine Riser Package (LMRP) and the drillship means that the cap over the well is seeing some slight movement with the waves. This may soon have an impact on the collection efficiency. This is already suffering some impact due to weather – after reaching levels of about 25 kbd. For the first 12 hours on June 30 (midnight to noon), approximately 6,085 barrels of oil were collected and approximately 4,145 barrels of oil and 24.9 million cubic feet of natural gas were flared. The major impact, however, is likely to come from the delay in the changing of the well cap, and the connection of another tap of oil from the well, through the kill line. The conditions on scene at the wellhead right now are winds between 17 and 22 knots and we have a sea state of about seven feet. In the next 24 hours, we look for that to diminish slightly the wind to 12 to 14 knots and over the next 24/36 hours to have the wind drop—the sea state drop to about six feet. The major impact on the operations out there right now have to do with hooking up the third producing vessel the Helix Producer, which was anticipated to have been done right about now but has been delayed because of the ability to hook up to the flexible hoses been prohibited by the sea state. But we are able to continue the production that’s going on out there and last night over the 24 hour period that ended at midnight we produced 25,000 barrel—over 25,000 barrels. The Development Driller 3 is within 16 feet of the well bore continues to go down 2 or 300 feet at a time continues to close the well bore. Put electrical sensing device down to check the magnetic field to find out exactly how far they are away. They’re in their third series of what they call these ranging activities. And they’ll continue to do that over the next several weeks as they get to the optimal point where they can turn and actually intercept the wellhead. (As I noted yesterday BP say they are only drilling 125 ft before running another test and they will proceed until they are 5 ft away). Once the wave action drops below about 3 – 5 ft then the cap on the well will be replaced. They have to undo 24 bolts to do this and that will need almost a calm sea to get the old riser end off the well, and the new cap in place – since it has to be lowered into place from a ship on the surface. Once the new cap is in place, the risers for additional collection are also available for hook-up. The new connections already in place will also allow the vents on top of the existing cap to be closed, at least partially, as oil and gas are diverted to the Helix Producer. (The decision has to be approved by Secretaries Salazar and Chu, however, before it can be implemented). One thing that I think is worth mentioning over the change in cap designs is that the new cap seals at the BOP. Thus when the mud starts to flow into the well from the bottom, it will also flow up the riser pipes toward the surface. Thus the additional gain in pressure from that height of a mile of mud – over the seawater pressure at present – will act to help raise the pressure at the bottom of the well and kill it. Out of the 68, government-to-government offers to date 35 appear to be equipment or resources that we could use. We’ve accepted nine of those offers already and 24 of those offers are being processed right now through the State Department for acceptance. This is an ongoing process has been from the start but wanted to give you an update here. Of the 39 private offers, it looks like 30 of those are equipment or types of materials that we could use. Those have been provided to our folks that are out there acquiring whatever it is booms, dispersants, or skinny material and they become part of the broader source of supply that we’re pursuing in trying to resource our operation moving forward. The Admiral is now retiring, and returning, pro tem, as a civilian employee. Yesterday I mentioned the procedures that John Wright, who is in charge of drilling the relief well, had previously used, and described in his company brochure. His company (later sold to Boots and Coots) also put out a primer on blowout control. One chapter of this dealt with the use of relief wells, and explains how the development of detection technology and kill fluids has made the technique more viable and effective. It is noted that build rates of 20 deg/100 ft are now available, positional accuracy of 5% of the standoff distance are achievable. The RW will be 5 ft from the wild well (WW) so that this gives a precision of measurement of 3 inches. There is not that much more on the tools to make the connection, however, so let me very basically comment on how a mud motor, or to give it the more technical name, a turbine motor works. I am doing this anticipating that there aren’t that many folks that have gone through the Tech Talks that have covered these issues in the past, and so there will be a little repetition from the talk on down-hole motors in what follows. The idea of putting a motor directly behind the drilling bit is not recent, the first Russian turbine drill was designed in the mid 19th Century however it required a number of stages before the design could turn out enough power. And the first patent for an American downhole turbine was granted in 1873. For those who are not familiar with a turbine drilling motor, essentially it consists of a set of fixed turning vanes at the top of the motor (the stator vanes) which direct the flow of mud going down the hole to flow onto a second set of vanes (the rotor vanes) which are pushed around by the flow, causing the drive shaft to which they are connected to rotate. By combining a series of these stages together into a multi-stage turbine considerable torque, and speed, can be passed to the drilling bit that is attached to the rotating drive shaft. Putting the motor at the bottom end of the drill string had a couple of other advantages. One is that it allows the hole to make angle, i.e. to turn in a tighter radius than if the whole pipe were rotating. While conventional rotary rigs can build angle at only 10 degrees per 100 ft, with a down-hole motor the angle can normally build at 13-15 deg per 100 ft, and John Wright has been able to increase this to 20 deg/100 ft. The Russian idea took a while to catch on in the West and to his credit, a guy in Houston called Bill Maurer, had a fair bit to do with that. Time and technology have however moved on a bit since then, and Bill’s company was acquired by Noble Drilling Corp so I can’t pass on links to the firm. With the advent of down-hole motors there is no need to have the complexity of joining 30-ft lengths of drill pipe together to deliver power to the end of the bit. This had always been constrained by the steel strength and joint limitations. Now that could be designed out, and the power could be delivered to the bit hydraulically through the mud, since this could be used to drive the motor. Later motors have included positive displacement designs, such as the progressing cavity motors which Dyna-drill illustrates with an animated figure at their web site. For those interested in relative performance, and the gains that technology can bring there is a case study available of a well drilled with a down-hole motor and PDC bits with a rate of penetration (ROP) of 93.5 ft/hr. 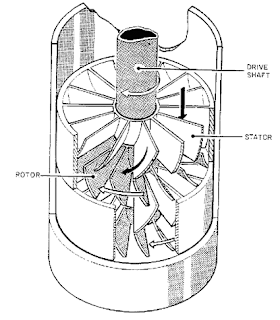 Turbine motors work best at higher speeds, but to create the chips and achieve effective drilling with conventional tri-cones, rotation speeds had, historically been slow. And the problem remained of creating the high thrusts across the bit that were required for this type of drilling, when the motor turned faster. One answer came in response to a second problem. As the rocks that have to be drilled become harder, so the forces used to cut through them also up, causing a materials problem. The materials used to make the drill bits were either wearing out, or teeth were being broken out as the bits pushed through the rock. But until now we had tried to break the rock in compression by pushing the tooth into the rock but if, instead we dragged the bit across the rock without trying to chip it, in the same way as a metal-cutting bit on a lathe peels off a layer of metal, maybe we could lower the forces on the bit. And if we used a diamond tool to do this, then while each diamond insert would only remove a very small amount of rock, we could impregnate a whole bit face with small diamonds ( much cheaper than the single stone you buy for the intended, since they are much smaller, and more common). These diamonds can be dragged over the rock face and slice off very thin layers, but can do so when moved at a very fast speed. Putting the two together meant that a new drilling concept could be developed, and a new drilling bit. The next development came about with the development of larger polycrystalline diamond compacts (PDC's or PCD's depending on your level of technical correctness). By making these larger diamond coated discs and setting them on the drill bit it was easier to circulate the mud so that it kept the diamonds cool. The diamond is a thin layer on the face of the disc, that is formed at extremely high temperature and pressure, at the time that the small cylindrical insert itself is formed from tungsten carbide powder. The cylinders, and their distribution can be seen in this typical bit layout. This is important since, if you get the temperature of the inserts (which might each be quarter to half-an-inch in diameter or more) above about 3-400 degrees, the diamond starts to soften a bit and wears faster. In this regard the design of these bits is still not perfect, but it has become better. In particular PDC bits can cut through metal as easily as they cut through rock. And thus they have been used, for example as “junk mills” tools specially designed to cut up metal pieces that might, for one reason or another fall into, or break-off in, a well. It is this metal cutting ability that will be used in the Deepwater Horizon application. The bit that will be used appears to look a lot like the one I illustrated last, and will be run into and along the old casing and cement, at a high enough intercept angle that it won't bounce off (greater than about 15 deg) but grind through both to open a window of access for the mud in the RW to flow into the WW and kill the well. This is the initial plan. If it doesn't work, for whatever reason, possibly not getting the RW into exactly the right alignment and distance, then the intercept could be carried out from the RW using the shaped charges on a wireline, that I mentioned in the earlier posts on the topic. PDC Drill Bits improve drillbit performance for dynamic stability in vertical and directional wells. Those mud motors and drill bits are incredible. I spent some time up in the oil patch in Alberta and had to carry some of those drill bits around. They are unbelievably heavy. It is crazy how the mud can wear them down so much.